Boz: I have worked a few times with Gun Envy, including getting some engraving done. Good people and a legit company in a sketchy part of town. I have used them and a Delaware company, D&D Tactical Solutions for inexpensive transfers. D&D is a garage FFL, but trustworthy. Q, do you still have that sequential pair of non-railed exceptions? Thanks. I will give Velocity Works a look. I will also stop into Gun Mafia's shop as they are literally 2 minutes from my work. I have not heard the greatest things about Gun Envy, so I am probably going to stay clear of there. I am now on my hunt for a non-railed, used, P229 in 9mm. Going to start looking at some of the more credible online sellers. I am also going to look very closely at The Classifieds. I may just end up getting 2. 1 nicer used one (probably railed) and 1 I can practice some gunsmithing on. Either way, both with be treated well, but shot often. Yes. And, it all thanks to you. You don't have a non-railed WG P226 or WG P228? Hope you find what you want, but I see no reason to buy a P229 unless you want 40 or 357sig. Looks like Recoil Gunworks has some right now for $500. A member is selling a railed ANIB 229 in the classifieds section right now for $649 shipped with the box and everything and unfired. RobC2 and jimmy123x... Thank you. 1lowlife... I would purchase either of those in a heartbeat (or both, I have the cash to put on the table now), but I would have to buy local or from a trusted Sig Forum member as I would need to see (or have honest eyes see) one or both before I would agree to a sale. In order, I would love a no rail, West German made 228, then the same in 226. Why does everyone dog the 229? I understand that it may have been developed for the 40 to fill a need for a police service gun, but I was always under the assumption that it was just a 226 with its nose chopped off and beefed up in some spots. I do not have the specs in front of me, but a 9mm 229 can't be that much of a pig, can it? I do not have the specs in front of me, but a 9mm 229 can't be that much of a pig, can it? Less than three oz difference. About 10% heavier than the 228. I love both models. 229-1 is one of my favorite guns ever produced. Everyone? You're looking at one who doesn't care for the P229 in any calibers except the 9mm. Btw, the P229 was developed for the .40 yes, but its development had nothing to do with the P226. It's not the P226 nose being chopped off, and it's definitely not beefed up in just some spots. Its slide manufacturing process was entirely new at the time, a one-piece machined stainless steel construction that could withstand the much higher pressure of the .40 round. Before this, it was just the old folded/stamped 2-piece carbon steel slide SIGs that shoot the 9mm and the .45. The folded slide is not strong enough for .40. Sweet! Always like seeing that awesome pair. This kind of wisdom and knowledge is what makes this a really great forum! Thanks for sharing your SIG knowledge! I have been registered for a long time and have very few posts. Most of my activity here has been reading posts from others during my work breaks and lunch. Well now that I have retired, I hope to share a bit more and do less creeping. I love my Sigs, but have not taken the time to learn all of the history of the various guns. For the past 10 or so years, I just been buying them, shooting them and enjoying them. I now want to learn more about them, how they work, why they are designed the way they are, etc. This is why the older, used Sigs are now on my radar. 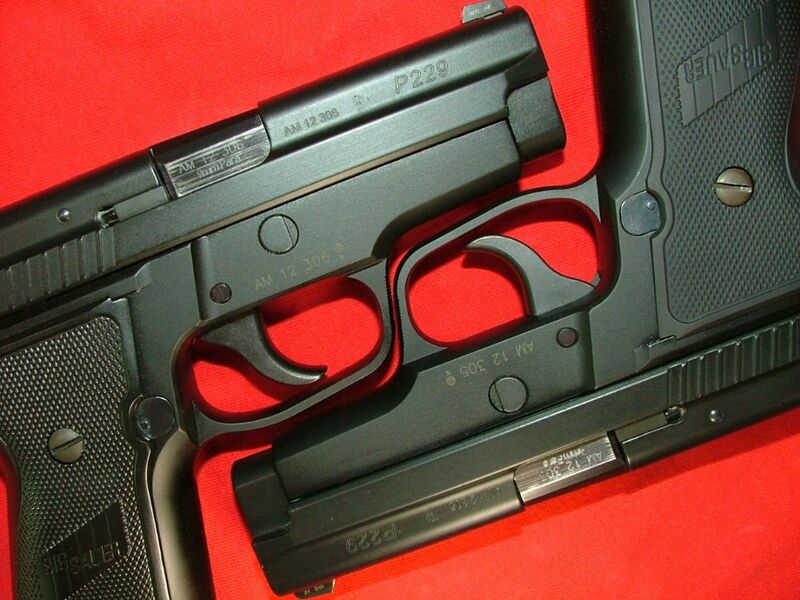 The reason for the 229 is so that I can have 1 of each of the "classic" Sig pistols. The no rail 228 and 226 are in my future, but I need to learn more about them before I throw down hard earned money on what may not possibly be that great of a buy. As of today though, I have the cash in my gun fund to throw down good money if a good example of either become available to me. Work has been a little crazy the last few days, so I have not started my search on the gun boards yet. That will begin tomorrow night. I just purchased a used 229 in 9mm for $399.00. Came with 2 10 round magazines. Put 100 rounds through it with no problems and more than acceptable accuracy. I had seen two used 229's in the past few weeks, one for $550 and the other for $485 and when I looked at the one I did buy I found it in good condition and am very happy with the purchase. Keep looking.